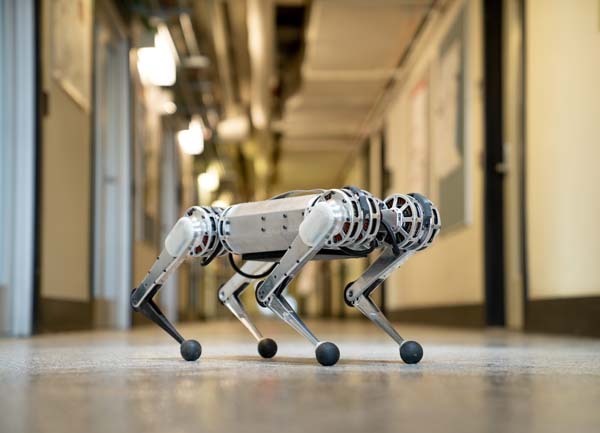 If a limb or motor does break, the mini cheetah is designed with modularity in mind: Each of the robot’s legs is powered by three identical, low-cost electric motors that the researchers engineered using off-the-shelf parts. Each motor can easily be swapped out for a new one. “You could put these parts together, almost like Legos,” said lead developer Benjamin Katz, a technical associate in MIT’s Department of Mechanical Engineering. “A big part of why we built this robot is that it makes it so easy to experiment and just try crazy things, because the robot is super robust and doesn’t break easily, and if it does break, it’s easy and not very expensive to fix,” said Katz, who worked on the robot in the lab of Sangbae Kim, associate professor of mechanical engineering. 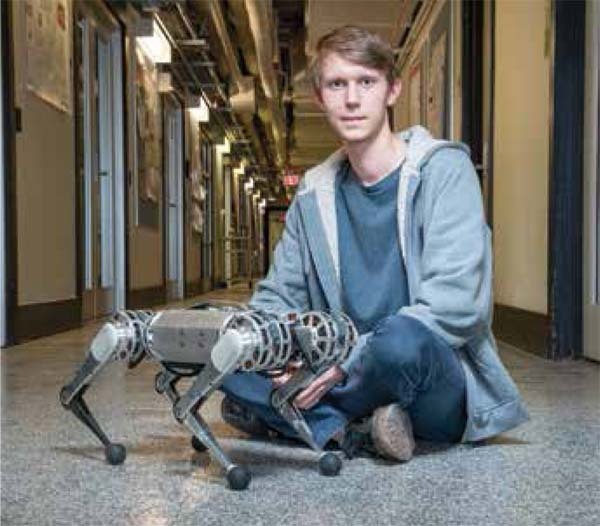 Kim said loaning mini cheetahs out to other research groups gives engineers an opportunity to test out novel algorithms and maneuvers on a highly dynamic robot, that they might not otherwise have access to. Each of the robot’s 12 motors is about the size of a Mason jar lid, and consists of a stator, or set of coils, that generates a rotating magnetic field; a small controller that conveys the amount of current the stator should produce; a rotor, lined with magnets, that rotates with the stator’s field, producing torque to lift or rotate a limb; a gearbox that provides a 6:1 gear reduction, enabling the rotor to provide six times the torque that it normally would; and a position sensor that measures the angle and orientation of the motor and associated limb. “We thought it would be a good test of robot performance, because it takes a lot of power, torque, and there are huge impacts at the end of a flip,” Katz said. The team wrote “giant, nonlinear, offline trajectory optimizations” that incorporated the robot’s dynamics and actuator capabilities and specified a trajectory in which the robot would start out in a certain, right-side-up orientation, and end up flipped 360 degrees. The program they developed then solved all the torques that needed to be applied to each joint, from each individual motor, and at every time period between start and end, in order to carry out the backflip. “The first time we tried it, it miraculously worked,” Katz said.